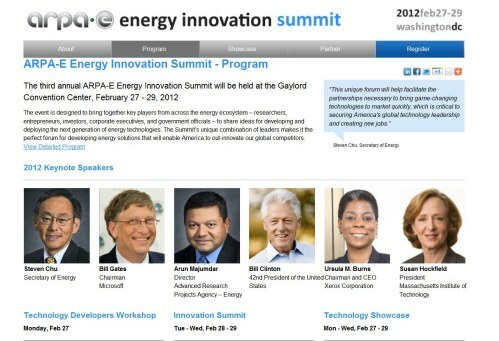 The third annual ARPA-E Energy Innovation Summit will be held at the Gaylord Convention Center, February 27 - 29, 2012 in Washington, D.C. Included by invitation will be key players in the split-cycle engine technology. The ARPA-e 2012 event is designed to bring together key players from across the energy ecosystem – researchers, entrepreneurs, investors, corporate executives, and government officials – to share ideas for developing and deploying the next generation of energy technologies. The Summit's unique combination of leaders makes it the perfect forum for developing energy solutions that will enable America to out-innovate our global competitors. Keynote speakers include the following: DOE Secretary Chu; Bill Gates as Chairman; Bill Clinton - 42nd President of the United States; and others. For the record, the Advanced Research Projects Agency – Energy (ARPA-E) is a new agency within the U.S. Department of Energy (DOE) designed to harness the nation’s most innovative minds to unleash an energy revolution. Unlike other government organizations, ARPA-E invests exclusively in high-risk, high-reward energy technologies – potential breakthroughs that would forever change our world and the ways we use, produce, and store energy. ARPA-E’s unique multifaceted approach combines industry-leading scientists, engineers, and business executives to identify promising solutions to the nation’s most critical energy problems. Leveraging the best practices of academia, government, and business enables ARPA-E to fast-track new game-changing technology towards the marketplace – which is critical to securing the nation’s global technology leadership and creating new American jobs. I first received notice of this event via Dr. Oded Tour of Tour Engine. For the record, I met Dr. Tour in 2011 at the DEER Conference in Detroit. The latest email indicated he was very proud to be accepted and invited for the ARPA-E Energy Innovation Summit; and with good reason. He is being listed among the best of those with the greatest energy innovations. When I checked the list, I noticed that many of the companies I have been covering the past two years will be in attendance. Aside from Tour Engine, Scuderi Engine and Cyclone Power will also be attending. In fact, under vehicle technologies, about 21 companies will be presenting. General Atomics, for example, will be presenting its Double-Sided Switched Reluctance Motor. The proposed double-stator switched reluctance motor (DSSRM) completely eliminates the use of rare earth metals. The concept is “double-sided,” with a stator on both sides of the rotor. This unique solution overcomes fundamental limitations of conventional single-sided switched reluctance motors. The technology has the best chance to meet the challenging ARPA-E power density and cost metrics. With regard to propulsions, though, it is no secret that I favor the split-cycle engine technologies, with all respect to other fine technologies. Simple reason is, I believe it has the best chance at being accepted by OEMs at this point for light vehicle; although it is capable for heavy trucks as well. One additional company is worth noting, as I have covered its technologies here at TorqueNews, which means TN writers are on top of the latest innovations. Opposed pistons seem to be where it's at in combustion innovation right now. OPOC is one I've been following for quite a while, generally for heavy commercial use, though they do plan to develop it for scaled use in smaller vehicles as well as very large industrial applications. The designs of these opposed pistons is great since it can be scaled upwards almost infinitely. You can have a 2-cylinder, 4-cylinder, 6-cylinder, etc engine and even have one engine that shuts down or powers up cylinder pairs as needed. Variants of this are being developed by several parties here and abroad. It's one of many amazing technologies coming to transportation in the near future. Look at Achates Power which is a two-stroke opposed piston; obviously not a split cycle which is 4-stroke, but worth noting for trucks. Ya, I've covered them on GreenBigTruck.com. There's a ton of great stuff like that coming down the line now.